DeFenders are fabricated entirely from CNC laser-cut, precision brake-formed 3/16 inch plate, either heavy duty P and O Steel or lightweight 6061-T6 aluminum. Only one competitor manufactures a fender that is anything like the DeFender fabricated entirely of plate with no tubing, but their design leaves a vertical edge of the metal pointed downward, right at the tire. The DeFender has an extra return, or lip along the underside of the fender, which provides better protection from cutting into a Fully stuffed tire, while also lending extra strength to the outer edge of the fender, where it is most likely to come in contact with rocks, canyon walls, trees, etc. DeFenders are Not tube fenders they are better! Much of the Jeep armor industry was built upon the Poison Spyder original Tube Fender design, which has been borrowed, copied, and in some cases even improved upon, by many of our competitors. But now the state of the art in Jeep fender armor takes a giant leap forward with the DeFender product line. Rather than tube, the outer edges of the DeFender are brake-formed into a rugged 3-sided rub rail. Most tube fenders use a piece of .120 inch thick (just under 1/8 inch) tubing as the outer edge rub rail, with 1/8 inch thick sheetmetal top plates. Compare that to the 3/16 inch (.188 inch) thick material of the DeFender which is carried throughout its structure, from the outer rub rail surface to the top plates to the mounting structure. The DeFender is Not only much stronger than a tube fender, it looks much better as well, with smooth flat surfaces that blend better with your Jeep exterior appearance. Even on the non-highline version, the DeFender provides a much larger wheel opening than Stock or some competitors tube fenders. The back of the wheel opening, where larger tires tend to rub when the steering is at Full-lock, is approximately 2.5 inches further back compared to typical tube fenders, and about 4 inches further back than the Stock Jeep flares. Access holes in the side of the DeFender make it easy to access the area between the wheel well and the firewall during installation. After installation, these holes are covered with a choice of different side cover plates. For the simplest install, choose the DeFender Side Inserts, which fill the access holes in the side panels of the DeFender. DeFender Side Inserts are CNC laser cut from 1/8 inch aluminum plate. The Spyder logo cut-out acts as an air vent to promote airflow through the engine bay. The Side Inserts are designed to bolt to the inside surface of the DeFender, using the supplied stainless steel button head hardware. For those who want more substantial armor protection, the DeFender Full Length Side Plates extend from the fender flare rearward to the door opening, and from the top of the Rocker Knockers up to the hood line. 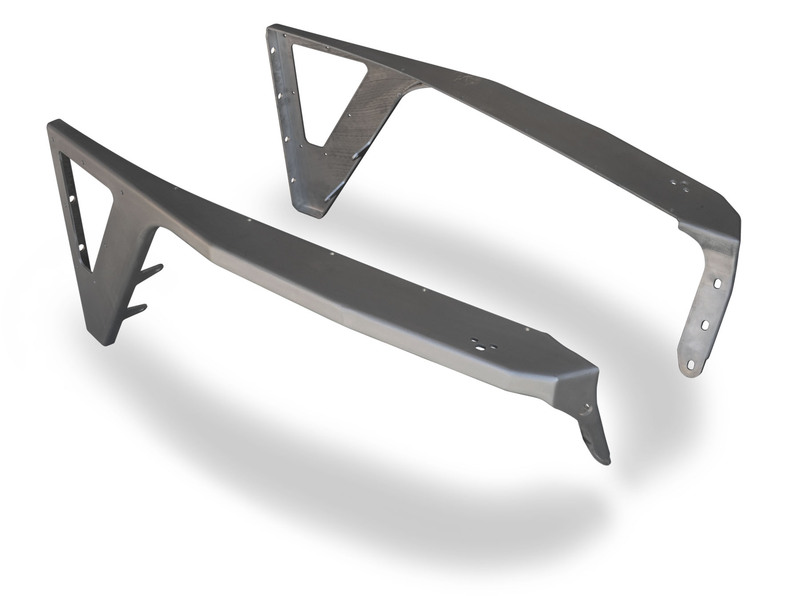 These Full Length Side Plates also provide extra bracing for the DeFender against frontal impacts, helping to prevent buckling of the weaker, Stock tub sheet metal just rearward of the armored fender. DeFender Full Length Side Plates are CNC laser cut from 3/16 inch 6061-T6 aluminum plate. Bolt holes are countersunk so that the supplied flat head stainless steel hardware lies flush with the plate surface. The forward edge is cut to fit the enlarged wheel opening of Poison Spyder DeFenders, while the lower edge is is cut to nest against Poison Spyder Rocker Knockers or Ricochet Rockers (Note: The angle of the forward edge of the Full Length Side Plates may Not precisely align with the forward edge of older versions of Rocker Knockers and Ricochet Rockers newer, DeFender-specific Rocker Knockers or Ricochet Rockers are designed to match the angle of this forward edge more closely).